It is important that Jesus’ death be seen not just as an isolated, individual event, but the death of religious system. The time had come to set people free to worship in spirit and in truth. The significance of riding the donkey mustn’t be lost – this kind of king doesn’t ride horses! A king riding on a donkey was a step too far for the imperial set-up. Kingship now belongs to ordinary folk who ride on donkeys every day. It was a similar story with the Temple, when he overturned the money-lenders tables. But as this was Passover the military was on hand and he was arrested and removed. The real meaning is Jesus’ life, not his death. It was his way of living that was found to be too provocative. By the time of Calvary it was far too late – the new way was already here, the seeds sown were seed of new life, not death. But there was a hesitant period – after his death it was a bit touch and go, the survival of the new way hung in the balance; even those who were with him fled – good men, but when the going got tough… Thank God for the good women – they stayed, right to the end. They came to anoint his body when the Sabbath ritual allowed it, and found the empty tomb. Interesting that Mary Magdalene’s recognition had nothing to do with expressing belief in the Resurrection. It was simply the plain fact that nobody but him spoke her name like that. Where his earthly dwelling ended, his enduring Spirit took over. Yes, he was gone – yet they knew he was alive; alive in a seemingly more real way than before. This was enough to bring back the faint-hearted. William Blake, The Agony in the Garden, c.1799-1800. Tempera on iron. Tate Britain. Image released under a Creative Commons license. Blake’s The Agony in the Garden is a highly original take on this scene from Luke’s Gospel. According to Luke 22:41-45, Christ kneels, praying to the Father to ‘remove this cup from me’; an angel appears to strengthen him, and as he continues to pray, ‘his sweat was as it were great drops of blood falling down to the ground’. Artists depicting this subject are usually faithful to the details of Christ’s kneeling and the presence of an angel (sometimes more than one is included), often holding a cup. 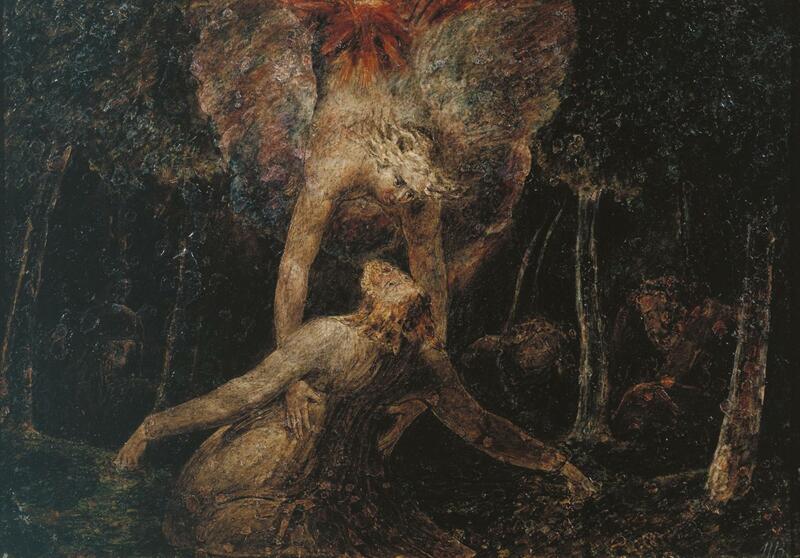 In Blake’s version, Christ is kneeling and his eyes are open, but he is falling backwards and being caught by an angel swooping down from above. There is a strong sense of intimacy in the interaction between Christ and the angel – the direct alignment of their faces creates a mirroring, and the embracing reach of the angel and Christ’s open arms are offers of union. Our eyes may not immediately tune in to notice the sleeping disciples in the shadows among the trees in the background. They have been relegated to this place of semi-darkness in stark contrast to the angel who appears in answer to Jesus’ prayers. The strangeness of Blake’s interpretation of this scene might emphasise the question of how we are to read the angel in this story? I wonder if Blake has presented us with a (rather unorthodox) depiction of the Trinity, with the angel representing the Father, responding to Jesus’ prayer, and the strange blast of red light above it as the Holy Spirit. What we certainly have is a powerful image of an angel as a positive, sustaining presence in answer to a prayer.